Daniel left us today, Tuesday the 12th of January 2010. Born in 1946 he gave his life to the cause of defending revolutionary Marxist ideas right to the end. A leader of the May 68 movement, he was one of those people with a very sure feeling for political initiative. He had been one of the leaders of the 22nd March Movement. Grasping the dynamic of social movements in particular the link between the student movement and workers’ general strike he was also one of those who understood the necessity of building a political organization, of accumulating the forces for building a revolutionary party. The quality of Daniel’s intelligence was to combine theory and practice, intuition and political understanding, ideas and organization. he could, at the same time, lead a stewarding force and write a theoretical text. He was one of those who inspired a fight which combined principles and political boundaries with openness and a rejection of sectarianism. Daniel, his own political convictions deeply rooted in him, was always the first to want to discuss, to try to convince, to exchange opinions, and to renew his own thinking. As a member of the daily leadership of the LCR from the end of the 1960s to the beginning of the 1990s , he played a decisive role in building a project, an orientation which combined daily activity with a revolutionary outlook. A good part of his theoretical and political work was focused on questions of strategy, and the lessons of the main historical revolutionary experiences. Daniel was profoundly internationalist. He played a key role in the building of the LCR in the Spanish state in the Franco period. In those years he played a major role within the Fourth International, in particular following closely developments in Latin America and Brazil. He contributed largely to renewing our vision of the world and to preparing us for the upheavals of the end of the 1980s. From the 1990s until the end, while continuing his political fight he concentrated on theoretical work: the history of political ideas; Marx’s Capital; the balance sheet of the twentieth century and its revolutions, first of all the Russian revolution; ecology; feminism; identities and the Jewish question; developing new policies for the revolutionary left faced with capitalist globalisation. He regularly attended and followed the Social Forum and the global justice movement. Daniel ensured the historical continuity of open, non-dogmatic, revolutionary Marxism and adaptation to the changes of the new era with revolutionary transformation of society always in his sights. Although seriously ill he overcame it for years, thinking, writing, working on his ideas, never refusing to travel, to speak at rallies or attend simple meetings. Daniel set himself the task of checking the solidity of our foundations and to pass them on the young generation. he put his heart and all his strength into it. His contributions, at the International Institute in Amsterdam, in the summer universities of the LCR and then of the NPA, at the Fourth International youth camp, made an impact on thousands of comrades. Transmitting the experience of the LCR to the NPA, Daniel decided to accompany the foundation of our new organisation with a relaunch of the review Contretemps and forming the “Louise Michel” society as a place for discussion and reflection of radical thought. Daniel was all that. And in addition he was warm and convivial. He loved life. Although many « 68ers » turned their coats and abandoned the ideals of their youth, Daniel abandoned none of them; he didn’t change. He is still with us. 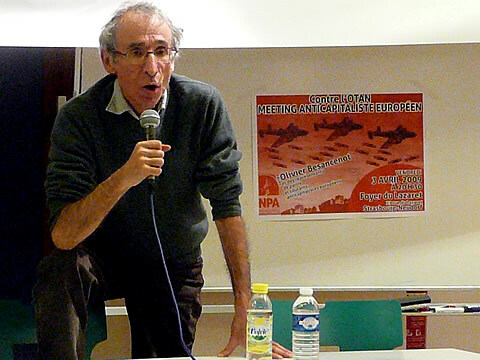 -François Sabado is a member of the Executive Bureau of the Fourth International and an activist in the New Anticapitalist Party (NPA) in France. He was a long-time member of the National Leadership of the Revolutionary Communist League (LCR).